The Guard (Russian : Караул, translit. Karaul) is a 1990 Soviet drama film directed by Aleksandr Rogozhkin. It was entered into the 40th Berlin International Film Festival where it won the Alfred Bauer Prize. The film is shot entirely in sepia. Alexander Vladimirovich Rogozhkin is a prolific Russian film director. The Internal Troops, full name Internal Troops of the Ministry for Internal Affairs (MVD), alternatively translated as "Interior ", is a paramilitary gendarmerie-like force in the now-defunct Soviet Union and in some of its successor countries, including in Russia, Ukraine, Georgia, Azerbaijan, Kazakhstan and Tajikistan. Internal Troops are subordinated to the interior ministries of the respective countries. 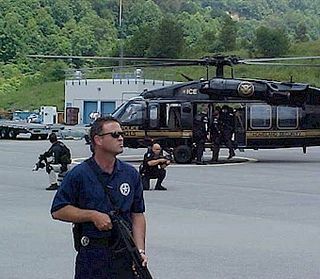 Prisoner transport is the transportation of prisoners by law enforcement agencies or contractors. Stolypin car is a type of railroad carriage in the Russian Empire, Soviet Union, and modern Russia. Aleksey Ivanovich Buldakov PAR is a Soviet and Russian movie actor. The USSR State Prize was the Soviet Union's state honor. It was established on September 9, 1966. After the breakup of the Soviet Union, the prize was followed up by the State Prize of the Russian Federation. Anatoly Alekseyevich Solonitsyn was a Soviet actor. The 9th Company is a 2005 Russian war film directed by Fedor Bondarchuk and set during the Soviet–Afghan War. The film is loosely based on a real-life battle that took place at Elevation 3234 in early 1988, during the last large-scale Soviet military operation (Magistral) in Afghanistan. Vadim Yusupovich Abdrashitov is one of Russian cinema's most independent directors. He is internationally renowned, with awards from the Berlin and Venice Film Festivals. Aleksandr Grigoryevich Zarkhi was a Soviet film director, screenwriter, and playwright. Aleksandr Zarkhi was granted the honorary title of People's Artist of the USSR in 1969 and received Stalin Prize in 1946. His film Twenty Six Days from the Life of Dostoyevsky was nominated for the Golden Bear at the 31st Berlin International Film Festival in 1981. Romeo and Juliet is a 1955 Soviet ballet film directed by Lev Arnshtam. The film was based on the 1940 production of Prokofiev's ballet, choreographed by Leonid Lavrovsky. It was entered into the 1955 Cannes Film Festival, where it won the Best Lyrical Film and was nominated as the Palme d'Or. The Flight is a 1970 Soviet historical drama film, mainly based on writer Mikhail Bulgakov's play Flight, but also on his novel The White Guard and his libretto Black Sea. It is written and directed by Aleksandr Alov and Vladimir Naumov and is the story about a group of White refugees from the Russian Civil War, eking out an existence in Istanbul and Paris in the 1920s. It was entered into the 1971 Cannes Film Festival. The Overcoat is a 1959 Soviet drama film directed by Aleksey Batalov, based on Nikolai Gogol's story The Overcoat. Friends is a 1938 Soviet biopic film directed by Lev Arnshtam. Aleksey Aleksandrovich Saltykov was a Soviet and Russian film director and screenwriter. People's Artist of the RSFSR (1980). Aleksandr Yakovlevich Askoldov was a Soviet Russian actor and film director. He graduated from the Gorky Literary Institute. After finishing the advanced directing course he directed his first film, Commissar (1967). The film was banned for more than 20 years and put an end to his career as a director in the USSR. 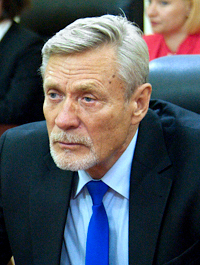 Aleksandr Yakovlevich Mikhailov is a Soviet and Russian actor. He has appeared in 42 films since 1973. He starred in the 1981 film Muzhiki! which was entered into the 32nd Berlin International Film Festival, where it won an Honourable Mention. The 38th annual Berlin International Film Festival was held from February 12 to 23, 1988. The festival opened with musical film Linie 1 by Reinhard Hauff. The Golden Bear was awarded to the Chinese film Red Sorghum directed by Zhang Yimou. The Servant is a 1989 Soviet drama film directed by Vadim Abdrashitov. It was entered into the 39th Berlin International Film Festival where it won the Alfred Bauer Prize. The Asthenic Syndrome is a 1990 Soviet drama film directed by Kira Muratova. It was entered into the 40th Berlin International Film Festival where it won the Silver Bear - Special Jury Prize. The Cow is a 1989 Soviet animated short film directed by Aleksandr Petrov. It tells the story of a boy who recalls how his family lost its cow. The film is based on a short story by Andrei Platonov and was made using paint-on-glass animation. ↑ "Berlinale: 1990 Prize Winners". berlinale.de. Retrieved 19 March 2011.